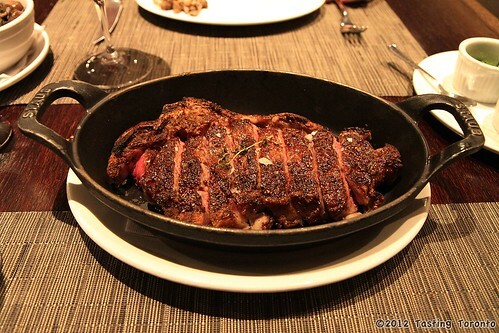 Jacobs & Co. Steakhouse is regarded as one of the best places to get a steak in Toronto. Steak still sits atop the food pyramid of most people as a decadent treat, which is ironic given that conceptually, all it is a grilled piece of meat. However, it is in that simplicity that elegance emanates. For not only does a great steak have to be cooked perfectly with that red juicy centre, ringed by a thin layer of pinkish gray, and mildly crusted with crispy, flavour-enhancing char, it must also be sufficiently marbled with the right distribution of succulent fat, and aged to perfection. Going out for steak is as much about the steak as going out for coffee is about coffee. 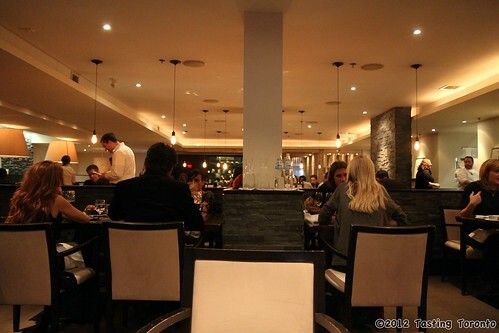 Of course the meat is key, but it's also about the whole experience of professional service by knowledgable staff, appetizers that presage the main attraction to come, and thoughtful desserts to cap off the meal. Exquisite wine is of course a fait accompli. The staff at Jacobs is indeed knowledgable. Our server went through the various kinds of meat on the menu and explained to us the nuances of each. We learned that Canadian Prime is grass-fed whereas the American USDA offerings from Nebraska are corn-fed. Grass imparts more complex and subtle flavours, but corn tends to exude that creamier mouth feel that one expects from your archetypal slab of beef. Canadian cows tend to be the Hereford variety while the American cows are Black Angus, and the Wagyu meat comes from Australia. Canadian Prime from Alberta tends to be found only in better steakhouses, at least here in Ontario, due to the lower volume, unlike their more prevalent American counterparts. Ontario Prime is even rarer. 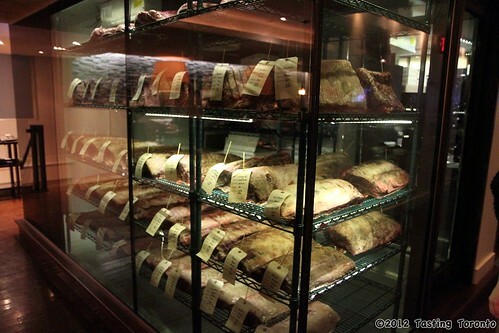 The steaks are aged from 38-46 days on premises in a glass room at the back of the dining room. We were told that the we were looking at probably $100,000 worth of meat as we peered through the glass. The process of aging was also explained to us where an enzyme called protease which naturally occurs in the meat, breaks down the long-chain proteins giving that distinctive tenderness and texture associated with high-end steaks. 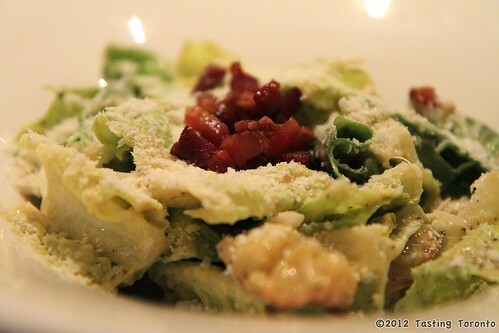 One of the main reasons we chose to go to Jacobs was oddly enough their famous tableside Caesar Salad. In an entertaining and educational display reminiscent of Mad Men, we got to watch as a Caesar Salad was made from scratch starting with anchovies, Worcestershire, and Tabasco. The longest and most important part of the process was emulsifying the extra virgin olive oil with an egg yolk and red wine vinegar. We found it interesting how important the order of when in the process the Parmigiano-Reggiano, the croutons, or the lemon juice was added. The salad was topped with large chunks of delicious smoked bacon. That was probably the best salad I've ever had. For our main course we had the 16-ounce bone-in Wagyu Striploin. Our server mentioned that the size of the steak made it ideal for sharing, and that a bone-in cut had more flavour than a cut without the bone. Our 38 day aged Wagyu came to the table medium-rare, fabulously marbled, and pre-sliced à la Peter Luger. It was accompanied by 3 different sauces (blue cheese, chimichurri, and ponzu), and 3 different finishing salts (fleur de sel, smoked, and black volcanic). That was easily one of the best tasting steaks in town. The Wagyu's marbling combined with the dry aging made in exquisitely tender and tasty. We liked it with the chimichurri sauce best, and the smoked salt was our favourite among the the finishing salts. 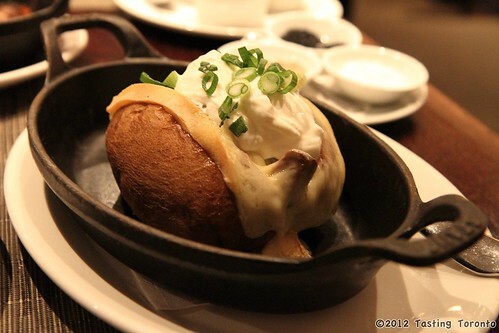 We had sautéed mixed mushrooms on the side, as well as the best spud I've had in a steakhouse, a baked potato stuffed with Wagyu brisket and Quebec cheese. 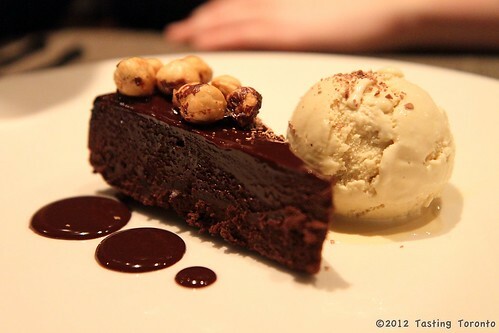 For dessert we had flourless chocolate cake with espresso ice cream and candied hazelnuts. I usually find flourless cakes a little on the bland side, but this cake was exceptional. The cool creaminess of the ice cream and sweet crunch of the awesome nuts balanced the textures quite nicely. We also had the house churned ice cream and sorbet. 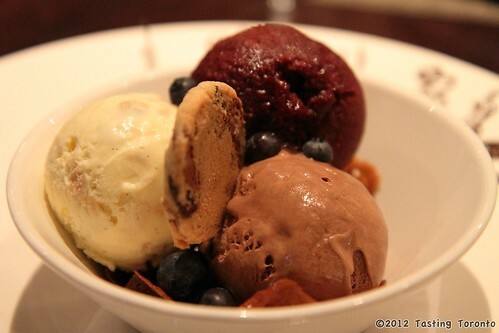 You can choose 3 flavours, and we picked pistachio, chocolate, and blueberry sorbet. The blueberry was fresh, sweet, and very concentrated. It lit up our mouthes like a Christmas tree. We even had to ask the waiter where it was from just incase it was available off premises. Sadly it was indeed made in-house and wasn't available retail. That was a great dinner and definitely a must-visit for steak lovers. Although we could see ourselves coming back for the tableside Caesar salad and the delicious desserts, perhaps with a less decadent cut of meat. Now how many steak places can you say that about? this is a beautiful summary of the jacobs experience! The Caesar salad experience used to be even better when Andreas was running point but he left a few months back! making me hungry! oh you forgot the chocolate chip muffins at the end! this looks soooooo amazing. I have never been here but I am going to be going very soon and now I am super excited. Already drooling! Wow...this place looks amazing! This is the second great review I've seen for this place! Thanks for the wonderful recommendation!! !